UNEX Manufacturing, Inc., the trusted industry leader in providing innovative order picking solutions, will be exhibiting their advanced order picking and lineside storage solutions at The Assembly Show in Booths 1231 and 1331 at the Donald E. Stephens Convention Center in Rosemont, IL. These solutions help manufacturers improve their assembly lines by better managing materials in these areas, helping to improve productivity, quicken delivery schedules and enhance customer satisfaction. “Manufacturers need to make sure that when the products arrive at the lineside assembly areas that they are labeled clearly and packaged well so that the contents can be easily identified. The less time it takes the assembler to visually recognize the part needed, select it, pick it and prepare to install it, the less time is wasted having to search for an item. Employees will be less frustrated not having to search for a particular part to finish their assembly,” said Brian C. Neuwirth, VP of Sales and Marketing, UNEX Manufacturing. UNEX lineside storage solutions improve picking operations within assembly. When customization is high in an assembly operation, having the ability to store additional SKUs in the assembly area means pickers don’t have to travel to find the right part, speeding fulfillment rates. Efficiencies and productivity are increased as well. UNEX Flow Cell workstations help with subassembly processes by bringing small parts that are to be incorporated into larger manufactured products together, providing a workbench on which to assemble parts. Components are stored in cartons or totes on the workstations, which also can be equipped with overhead toolbars, monitors and work instructions. 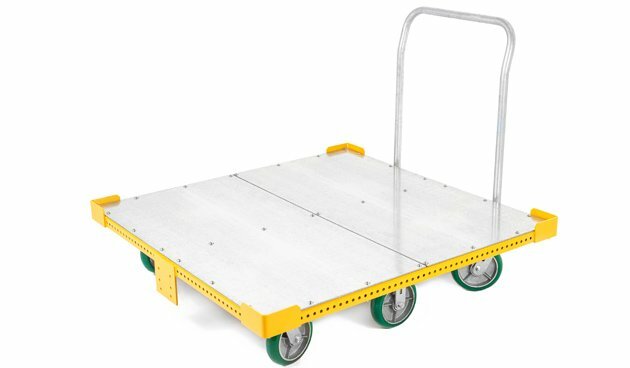 UNEX industrial carts are used to move materials, parts, boxes and components from one location to another within assembly operations. Carts are available with open shelving or racks to hold cartons or parts, improving picking operations and boosting productivity. UNEX will display a prototype version of its newest industrial carts to solicit feedback from the Assembly Show audience and to demonstrate the flexibility that makes Flow Cell an industry leading solution. Other UNEX Flow Cell products will be displayed to show how they can help maximize space, diminish movements with angled shelving, reduce waste with a lean focus and support FIFO methodologies so components never reach their expiration date. The Assembly Show takes place on October 24 – 26, 2017, in Rosemont, IL. Visit UNEX at Booths 1231 and 1331 to better understand how the company’s solutions increase productivity and reduce manufacturing lead times.